There is nothing like decorating and finding the perfect furniture and accessories, those matching colors and fabrics!!! Buttttttt when asked to do a Nursery, that all changed! 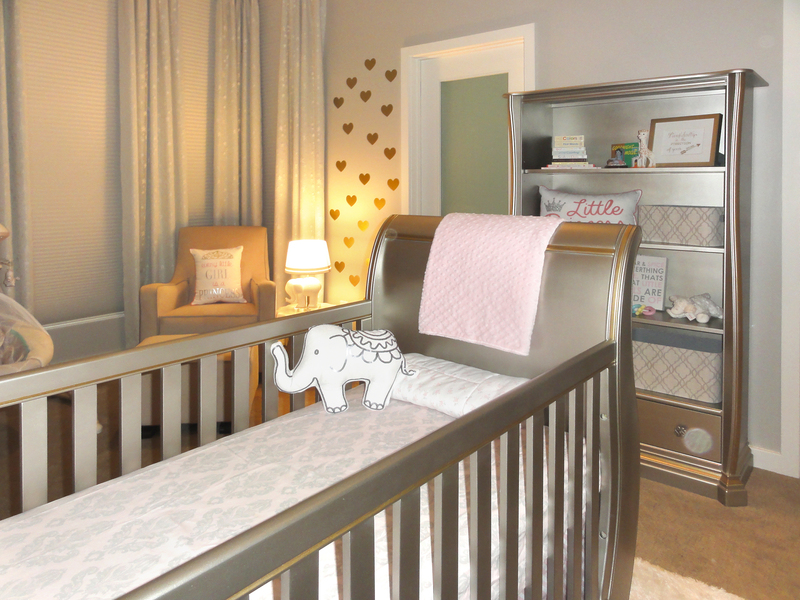 Not only did we fall in love with decorating all over again but designing a room knowing that a little princess is going to grow up in there, is pure happiness! We have gotten so many questions on how and why we chose to decorate this room the way we did; today we are here to answer those questions! Like any project, we started with 4 white walls! Just being in the space, is so meaningful, to hear what the mom to be wants and to help bring that vision to life is the best part! For this particular project, we waited to find out what our client was having and then every possible idea out there, came to life! We knew we wanted simple and sweet, something for this adorable little girl to grow into and not “too childish”. So we went with simple whites, greys, neutrals, metallics and dashs of pink! We presented with not 1 idea but 3! Afterall its a little girl!!! She should have options!!!! 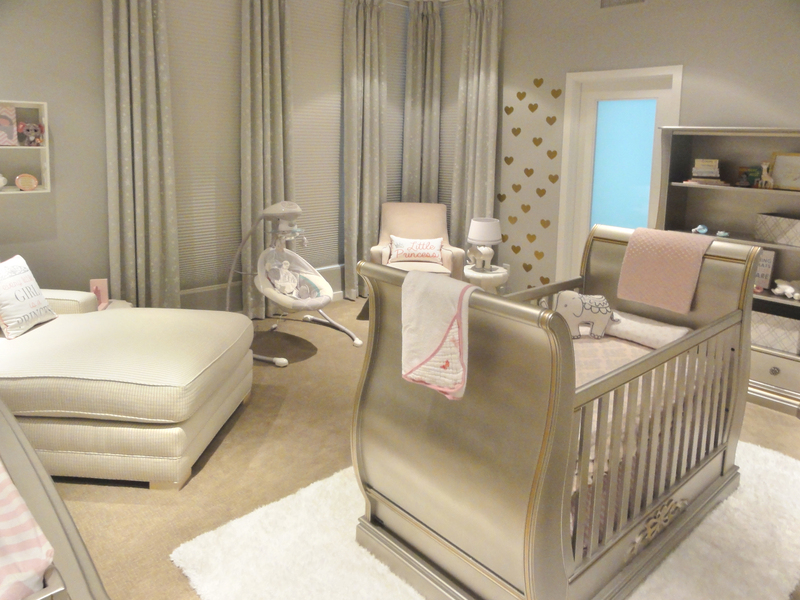 After loving all 3 we had to make a decision…..would it be the white crib theme? grey and white modern theme? or golden princess! Golden Princess it is! We worked with Karl’s Baby Furniture to customize the perfect crib, we chose the venice crib that converts for the baby as she ages! 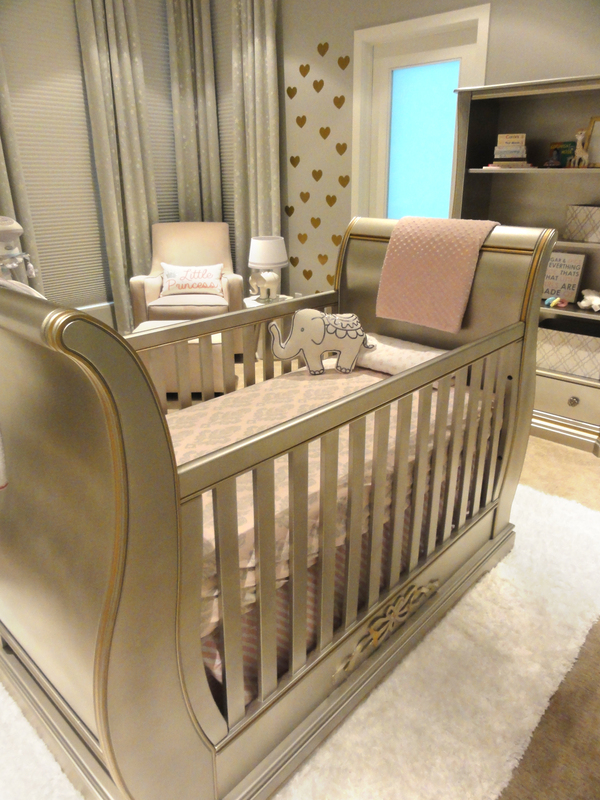 Next we found a dresser and bookcase that wasn’t apart of the Venice collection but we had it transformed into the colors to match the crib perfectly! Next we moved to find a glider and ottoman! 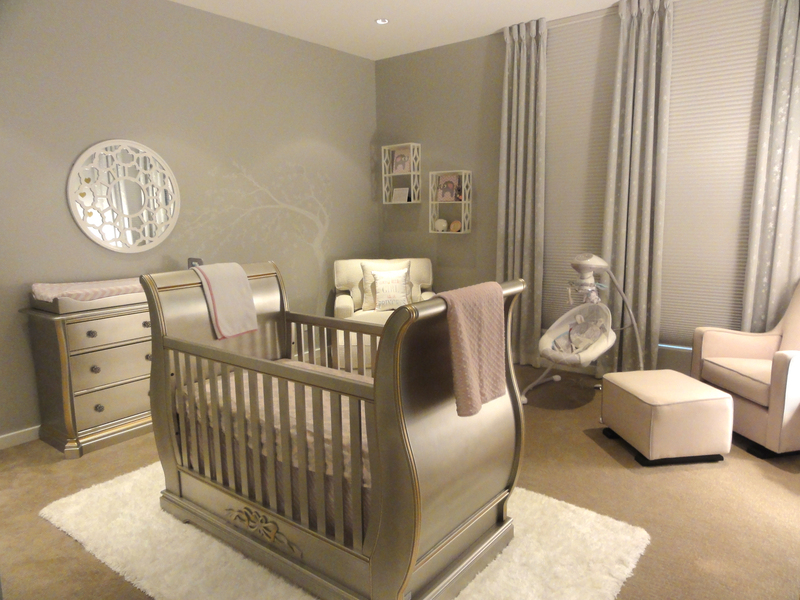 Klaussner’s Nursery Time collection was the most comfortable for our client! We picked custom fabrics to go with our theme! Our client also wanted a really cozy comfy chaise to lay in while nursing or sleeping in the room with the baby! We went to our go-to for comfortable! Lee Industries! NEXT was the fun part! Accessories!! We picked shelving, side tables, lamps, mirror, rug, and two really fun murals that we did ourselves!! THANK YOU POTTERY BARN KIDS and HOMEGOODS!! The ideas they have for kiddies are just the cutest!! Finally! 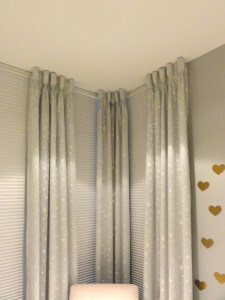 We had to do window treatments, are clients windows are extremely long and we obviously needed to have them made for room darkening as well! 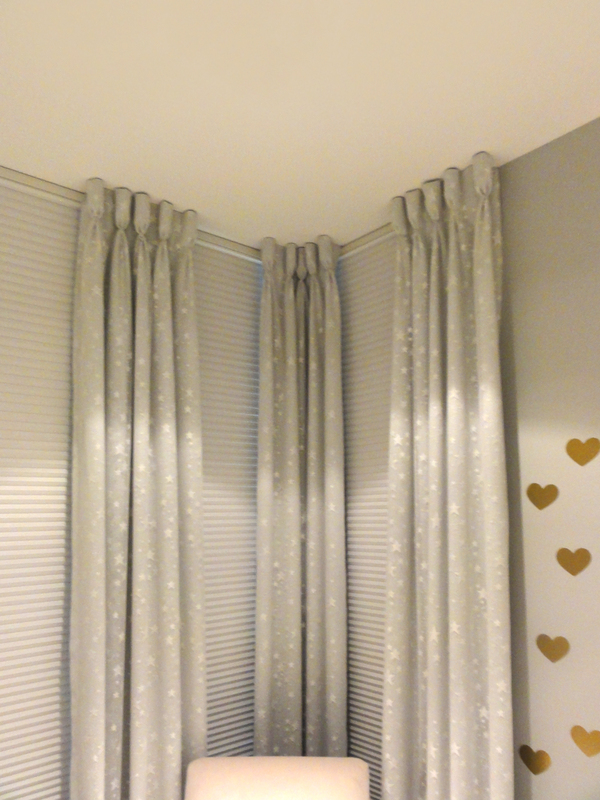 The fabric we found was literally hidden in line of sheers that had mini stars of them, we decided to line it with a grey sheer to pull the grey walls together, add goblet pleats and off we go to a perfect little cozy room customized and designed by Bella B Home! Let us know your thoughts!! 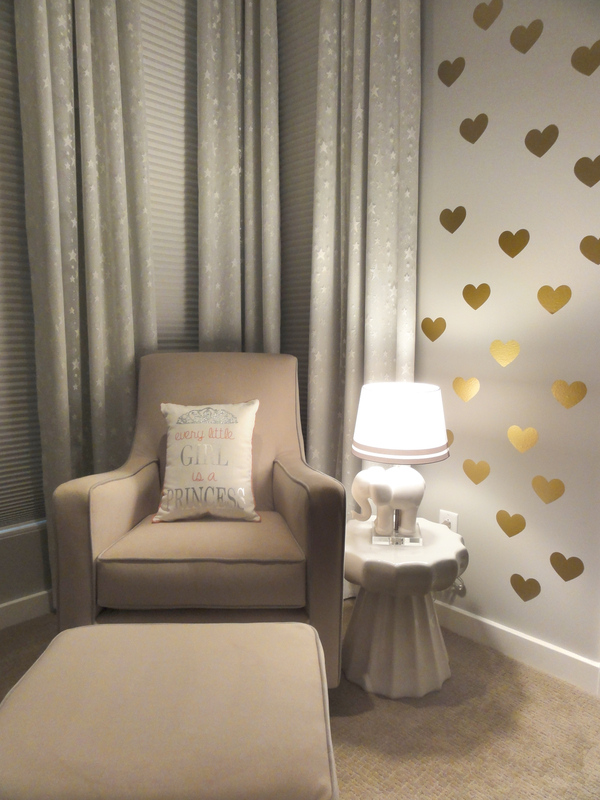 This entry was posted in Nursery and tagged Baby Girl Nursery, Bella B Home, decor, hgtv, home decor, houzz, Interior Decorating Philadelphia PA, Interior Design Philadelphia PA, interiors, lifestyle, luxury home, Nursery, Nursery Decorating Ideas on February 1, 2016 by Blair. New Year, New Home Decor!